Others reported how he simply laughed when a bullet that hit him in the shoulder, calling to his division commander, “I’ll give them one more shot—Good-Bye!” As he served up that last round, another bullet struck him in the mouth, passing through the base of his brain. He fell forward, lifeless, into the arms of his orderly sergeant, Frederick Fuger. Alonzo was the second youngest of five Cushing brothers. Born in 1841 in what is now the city of Delafield, Wisconsin, Cushing grew up in Fredonia, New York. In all, three of the brothers grew up and served the Union during the American Civil War. His younger brother, William, became a Union Navy officer. One of his older brothers, Howard, served in the 1st Illinois Artillery before taking a commission in his brother’s unit, the 4th Artillery in November 1863. After the war, Howard served in the 3rd U.S. Cavalry until he was killed in action fighting the Chiricahua of Arizona, in 1871. 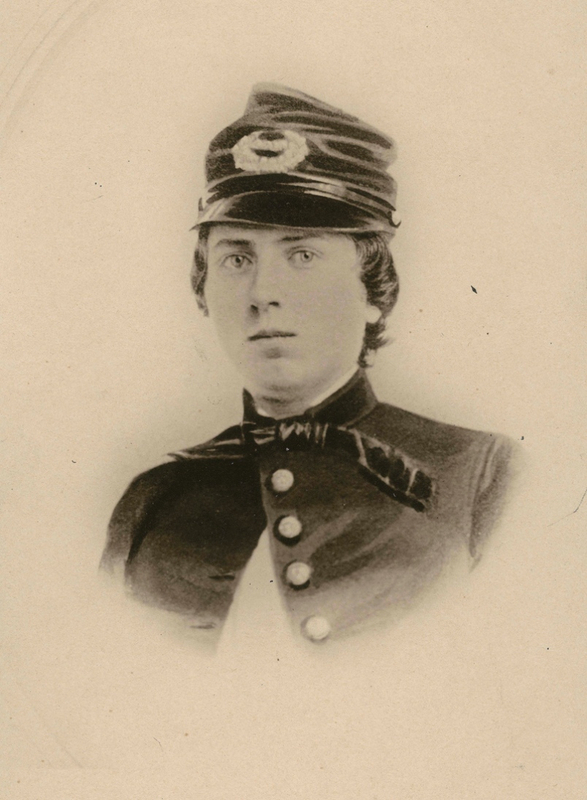 Cushing entered the United States Military Academy in 1857 and graduated with the the class of June 1861, when he received commissions as second and first lieutenant on the same day. He was brevetted major following the Battle of Chancellorsville. The 22-year-old Cushing commanded Battery A, 4th U.S. Artillery at Gettysburg. Battery A was at the key point called “the angle” in a stone wall facing the brunt of the charge by Confederate troops under Maj. Gen. George Pickett on July 3, 1863. Historians have called this spot the “high-water mark of the Confederacy.” Commanding a section of guns only a hundred yards in front of the Confederates converged at the wall, Cushing fell from a third, fatal wound. Contemporaries described his actions before he was killed as nothing less than heroic. His body was returned to his family and then interred in the West Point Cemetery in Section 26, Row A, Grave 7. His headstone bears, at the behest of his mother, the inscription “Faithful unto Death.” Cushing was posthumously cited for gallantry with a brevet promotion to lieutenant colonel. Federal law requires the Medal of Honor to be awarded within three years of the event unless Congress waives the requirement. Though the Civil War has generated more medals than any other American war, Cushing’s case was complicated by the fact that so few of them — 29 out of 1,522 — were awarded posthumously. In the 150 years since, debates have raged inside the War Department (now the Department of Defense) about the propriety of posthumous medals. Cushing was nominated for a belated award of the Medal of Honor, beginning with a letter campaign in the late 1980s by constituents of Senator William Proxmire of Wisconsin. The measure has been also been advocated by Congressman Ron Kind of Wisconsin’s 3rd congressional district. In 2002, Senator Russ Feingold of Wisconsin nominated Cushing for the Medal of Honor, and, following a lengthy investigation, the U.S. Army approved the nomination in February 2010. It was announced on May 20, 2010, that Cushing would receive the Medal of Honor, 147 years after his death. The provision granting Cushing the Medal of Honor was removed from a defense spending bill by Senator Jim Webb of Virginia in December of 2012, however. Finally, in December of 2013, the Senate passed a defense bill that included a provision which granted Cushing the Medal of Honor. The nomination was sent for review by the Defense Department, before being approved by President Barack Obama. Yet to be resolved is who will receive Cushing’s medal. The Army will accept the award on Cushing’s behalf, since he had no direct descendants. The city of Delafield — a town of about 6,000 people 30 miles west of Milwaukee — would like to display the medal at City Hall, said David Krueger, who serves as the mayor’s representative on the Cushing Medal of Honor Committee. A date has not been set for the actual award of the medal, though it is likely to occur at a Medal of Honor at a ceremony scheduled for Sept. 15 at the White House. At that ceremony, President Obama with decorate Command Sgt. Maj. Bennie Adkins, an Army Special Forces or his actions in Camp A Shau, Vietnam, over three days in 1966; and Spc. Donald P. Sloat, a machine gunner who distinguished himself during combat near Hawk Hill Fire Base, Vietnam, in 1970. Adkins will attend the ceremony. Sloat’s award, like Cushing’s, will be posthumous.